Real.Real people. Real alumni. Real stories. In the Summer 2011 issue of affinity magazine, alumni from all over the country shared their "How to..." tips. Alumna Carol Siegel Turner '72 '77 also wanted to share her own tip on how to be a civil war reenactor. Do you enjoy history? Do you like sharing your knowledge with other people? Well...do you enjoy wearing 6 layers of clothing in triple degree heat or waking up on a cold morning inside a tent with snow on your blanket,or running to a tornado shelter in a tornado scare? All of these things will happen, notice I didn't say they could happen, they WILL happen. Carol Siegel Turner '72 '77 tending to her spy doll (named Rachel). 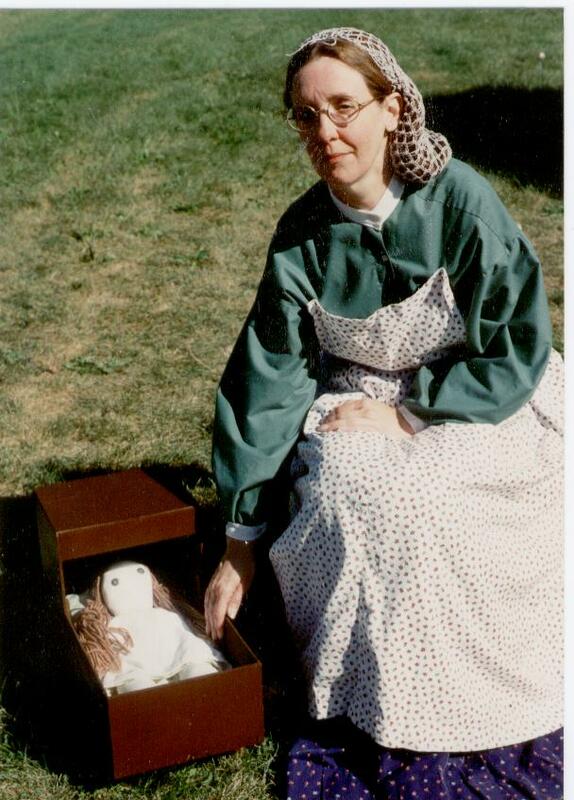 The picture was taken on the grounds of Anderson House at the Lexington, MO Battle of Lexington reenactment in 1993. The picture was taken before she purchased antique glass frames. Next is research, research, research! Also choose a persona and a scenario. This will take awhile, do you want to be a laundress, an officer's wife, a teacher or perhaps a spy. I've done all of these. The scenario you choose will depend on the reenactment you're attending. What type of people were there, was it a town or a rural area, did you live in a house or a cabin, did you have children, was you husband a soldier or were you married? Writing letters to your soldier can be a scenario all by itself. When you've chosen a persona pick a name too. Remember you're a living historian and accuracy is a must. So if in the 21st century your name is Brittany, Kaylee or Tiffany those names weren't used in the 1860's. But Judith, Sallie and Mary were, remember to keep you name close to your own (perhaps your middle name) so you'll answer if someone calls you. One of the other first things to have is comfortable shoes since you'll probably be on your feet all day. And find a good seamtress, the patterns at the sutlery will be very tempting and the fashions aren't available off the rack. As a living historian (I've said this before) accuracy is a must so do not wear any modern jewelry. Have your glasses lenses put in period frames, those can be found at an antique store. There's nothing worse to a spectator than to admire your dress, want to know your story and you turn around wearing a big smile and 2011 glasses and jewelry. Bad impression. You'll make the best friends you've ever had and they'll help you hone your impression. Those friends will also give you ideas. If you're uncomfortable in anyway, remember they've been there. I was a reenactor for over twenty years and kept my eyes and ears open, I learned and had a lot of fun. Being a reenactor will open doors to speaking and teaching students, ladies clubs, fairs, street festivals, television spots and spending some weekends being someone other than who I am. Which can be a wonderful way to recharge and relax. I found your post very enlightening. I've been interested in reenacting for a few years now. I've always enjoyed "becoming someone else for a while," and I've found that sense of breaking free of oneself is essential to a holistic understanding of history. A book I discovered recently really helped inspire me. It's called "The Southern Cause;" its a photography book full of beautiful black and white images of civil war re-enactors from around the south. There are interviews and testimonials too. I felt happy to know that other people feel the way I do. You should check it out at the link below.